Wrangling multiple USB 2.0 hubs, and want to consolidate a number of devices? These 13 Port Hi-Speed USB 2.0 External Hubs provide host computers with 13 additional USB ports and allow flexible tiered Hi-Speed USB configurations with a single hub! These robust and inexpensive hubs run in self powered mode and provides over current protection at each of their downstream ports. Fully USB 2.0 compliant and USB 1.1 backward compatible, it supports low, full, and high speed USB devices and works with any system that supports the USB specification. One of the 13 downstream ports is on top of the unit, and folds down for convenient access to portable USB 'thumb' Drives. Providing thirteen downstream ports in total, these hubs features plug and play installation and transparent operation. 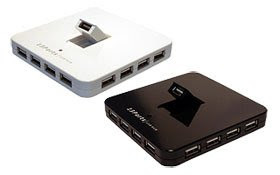 This hub is fully backward compatible with USB 1.1 and will work with systems and devices using the slower standard. It comes with a free power supply with a generous 4 ampere capacity, and USB 2.0 cable to connect to a host computer. What should I do If I have the following symptoms/problems running Windows XP or The Windows Vista?